Last September, the extremely unique (and high quality) T-shirt creation company, Threadless, held a contest to create a T-shirt inspired by the Pixar movie that started it all - Toy Story. From September 17 to October 9, 2012, eager artists submitted their designs (351 in total) and crossed their fingers, hoping that their creation would receive the most "5-out-of-5" votes. Heck, who wouldn't want to win? 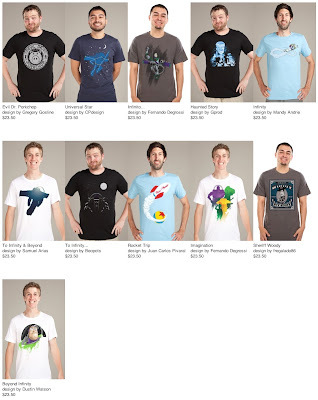 The prizes included cash, Toy Story toys, artwork and most importantly, the ability to have your shirt printed and official sold through the Threadless store. When the voting finally closed on October 14, 2012, there were eleven designs that rose to the top of the ticket. Among the selected designs was one by the extremely talented, Greg Gosline. His "Evil Dr. Porkchop" design took the top prize with its charm and unique artistry. Before we discuss our conversation with Greg, we should also note that due to the success of the Toy Story contest, Threadless has also activated a Monsters, Inc. contest. Although entries for the contest are now closed, you have a few more days to vote on your favorite Monsters, Inc. designs (more details below). 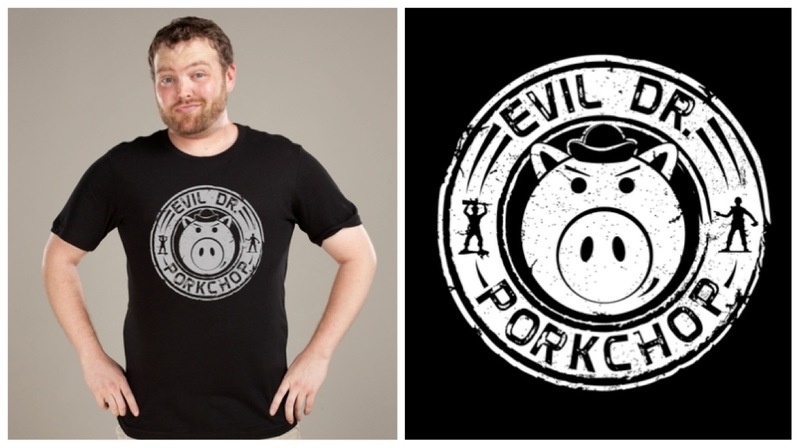 To purchase the winning Evil Dr. Porkchop T-shirt (or the other selected designs), click here. Note that our shirt is on it's way to us right now - once we have ours in hand, we'll post photos as well as additional comments. Greg is a passionate family-guy that oozes affection for his wife, Kim, and his 11-month-old son, Rocco. The Long Island, New York native currently works as a graphic designer for a major vitamin and supplement company - creating a variety of packaging, tradeshow booths and catalogs. His passion for art and character-driven stories stemmed from his early youth and grew exponentially with each movie release and trip to Disney World with his parents & siblings. Like most of us, the release of Toy Story caused something to click inside, he said, "My mind was blown, it was such a cool concept and such a different medium". For the current Monsters, Inc. contest, how did you decide to create your design based on the Yeti and "2319" catchphrase? The way I came up with my designs for Monsters, Inc. is very similar to the way I came up with the Evil Dr Porkchop design. I try to create shirts that I would want; You can go into any store and get a shirt with Buzz and Woody on them - or go into the Disney Store and get a Monsters, Inc. shirt with Mike and Sulley on it, but there are very few shirts that feature any other characters besides the main characters. I wanted to make designs from memorable scenes in the movies with some of my most favorite characters. I had said for years to my wife, "why don’t they make this - it's a good idea and how do they not make this". The contests gave me the opportunity to present these ideas. With the Yeti, he is such an awesome character that is in the film for such a short time but everyone remembers him and if you yell, "We have a 2319" anywhere the majority of people will know what you are talking about. I wanted to go with characters and designs based on topics that stuck with people. [PP] - What does the process of creating your designs look like (for instance - do you sketch on paper first, do you work solely in the computer, what program do you layout in, etc.)? [GG] - I have so many sketch books with Pixar related designs and ideas. I will usually sketch out the rough idea first on paper and scan it if I feel I need to. I do a little research, for example I watched the opening scene of Toy Story 3 a few times before starting Evil Dr Porkchop. But then I start in Adobe Illustrator and go from there - Illustrator is my weapon of choice as I put it, and love working in it. [PP] - We had to chuckle when we saw your post on Twitter stating (in a surprised tone) that you had won the Threadless Toy Story contest with your Evil Dr. Porkchop design. What went through your mind when you realized that your design wasn't just selected as one of the winning designs, but that it was selected as THE winning design? [GG] - Laughs - Yeah, I was looking at the shirt seeing what kind of response it was getting and I saw it said “Winning Design” - then I looked at the other shirts that were up and they said “Chosen Design”. To say I "freaked" would be an understatement. It felt awesome when they emailed me...originally it just said "selected design". So when I saw this I jumped out of my chair, did a fist pump, then composed myself and sat back down. [PP] - Additionally, we'd have to imagine that when you noticed that your name was printed on the inside of each Evil Dr. Porkchop shirt that you were blown away. Did you know that it was going to be included on the shirt and how did it feel when you finally received your shirt in the mail (and saw your name printed there)? [GG] - Totally blown away, I had no idea that they included that on the shirt. It was such a feeling of validation. I have had some work printed before elsewhere, but this was different - it had my name on it and the topic of the art was something I was so passionate about. The fact that people are buying something with my name literally on it still blows my mind. [PP] - Do you have any other Pixar-related work or works coming up that you can share? [GG] - I have tons of ideas and would love to make them all a reality; its funny because right before the Toy Story contest was announced I was talking to friends and family about starting a blog based on my Pixar themed designs. That is something that is definitely possible especially because I have a design printed and available now. I am going to continue to enter contests on Threadless and I am currently working on a Gravity Falls shirt design for a contest on welovefine.com. 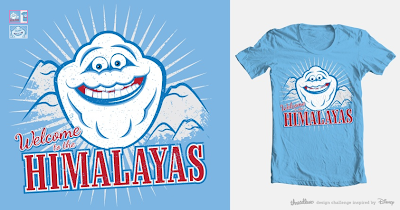 Now that you've read the candid interview with Greg, please offer your support and head over the the Threadless Monsters, Inc. contest and vote for your favorite shirt. 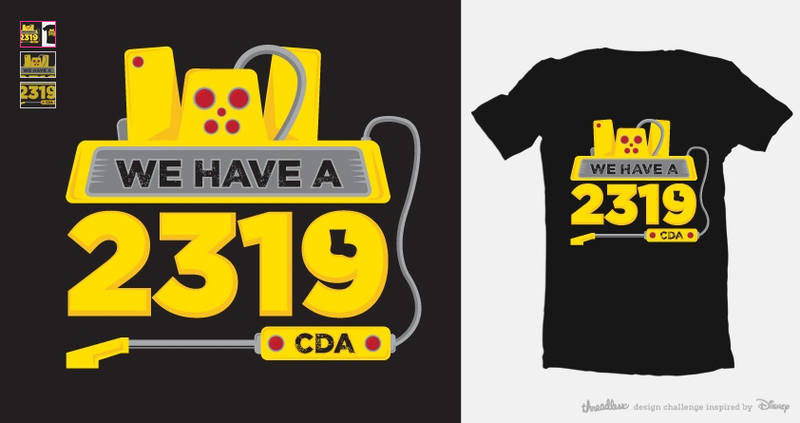 To vote for Greg's "2319" design, click here. To vote for Greg's "Welcome to the Himalayas" design, click here. Voting closes on January 14, 2013, so head over and vote for your favorites today. Which Monsters, Inc. design caught your eye the most?